A perfect romantic getaway suggestion! This sailing tour will probably make your stay in Barcelona an unforgettable experience. Warm sea breeze with an unique skyline of Barcelona at dusk, this private sailing trip is a perfect way to get a special day or evening with your loved one. You will get views of spectacular La Sagrada Familia, Barceloneta beach, Port Olimpic and more. This is a 3 hour sailing tour that starts by meeting your local skipper at the Barcelona Port. After a safety briefing and introduction to sailing, your romantic experience begins. Once you cruise out, the gorgeous Mediterranean sea opens up, and the views of the city are lifting the atmosphere to a high level. All you have to do at this point is to sit back, open your bottle of Spanish sparkling wine and raise your glass to toast for this special occasion vacation. Cruise along the Barcelona coast toward Port Olimpic where you’ll see La Sagrada Familia, Agbar Tower in the distance and the Tibidabo, sail past Port Forum and popular Barceloneta Beach – which is, in fact, the main beach of the city. You can choose between a daylight and an evening sailing tour, choosing the second one means relaxing and admiring Barcelona’s skyline in spectacular colors as the sun sets over the city. This romantic and unforgettable cruise ends with your last views of Barcelona from the water while you’re approaching the starting point of the journey – the Barcelona Port. The price for this romantic cruise is 170 Euro, and includes a professional skipper, life jackets and one bottle of cava – Spanish sparkling wine. Exclusions are food and drinks, unless specified, hotel pickup and drop-off and sailing clothes. 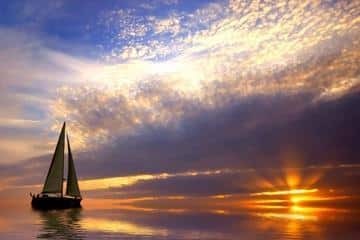 Important thing to add here is that this cruising option depends on the weather, so the sailing itinerary is subject to change being dependent on the wind conditions.